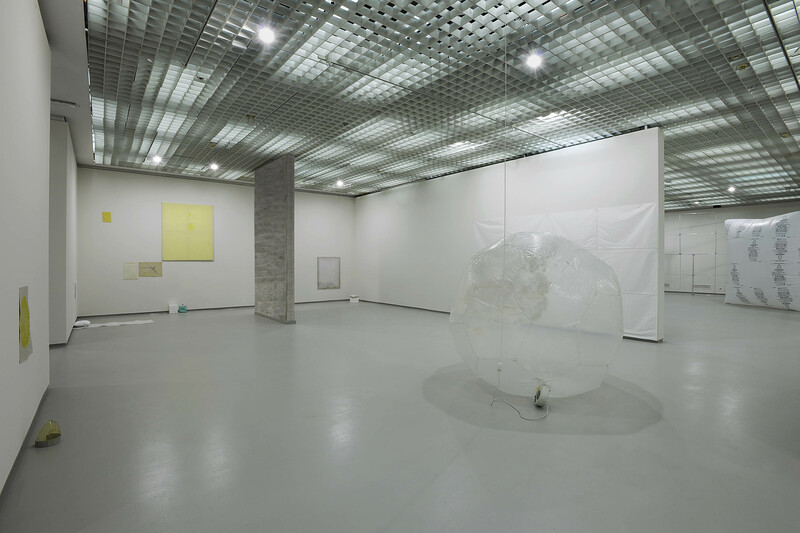 Kiaer’s solo exhibition ‘What Where’ presented a major review of the artist’s work from the past 10 years. Comprising 23 multi-part installations, the exhibition represented seven areas of Kiaer’s research. A particular research concern was how the house could be interpreted as a model of thought, looking specifically at Curzio Malaparte’s Casa Malaparte, and Ludwig Wittgenstein’s Kundmanngasse. Asking how notions of dwelling proposed by such buildings might inform different modes of making, Kiaer presented artworks that originated from the studio, probing the rapport between materials and motifs, groupings and spacings, and the made and the found. The exhibition included works previously exhibited at Tate Britain, Tate Modern, Manifesta 3, 10th Istanbul Biennale, 6th Berlin Biennial, 50th Venice Biennale, MoMA PS1 New York, MCA Chicago, Mori Art Museum Tokyo, Watari-um Museum Tokyo, Witte de With Rotterdam and Kunsthalle Basel. Articles reviewing the show included Barbara Casavecchia, ‘Ian Kiaer, theatres of vision’ in Mousse (2009) and Jonathan Griffin, ‘From room to room’ in Frieze (2010), where he describes Kiaer’s work as ‘an art of entropy and disintegration. Formally and philosophically, he tests the propensity of things to hold together, to prise apart of to float irredeemably away from one another’. Many of the works in the exhibition manifested research that arose from Kiaer’s doctorate; chapters from his thesis were published in A Prior no. 20 (2010) and Kaleidoscope (2010). A monograph accompanying the exhibition was published by Archive Books, Berlin (2009) in both Italian and English editions. The publication includes seven essays by Elena Volpato, Dr Andrew Renton, Chris Sharp, Dr Roger Cook, Luca Cerizza and Professor Robert Harbison. Each text comments on a singular aspect of the artist’s research, concerning the fragment as theory and method, and the potential of the artwork as model.